Here are the final two polishes - the cremes - from Zoya's Spring 2014 offering, called Awaken. Plus, the special glitter topper called Monet, which was released alongside the Spring collection. If you missed Part 1, with the shimmers, check it out here: Zoya Awaken Spring 2014 Pt. 1! Dot is a soft, pastel candy pink creme. I was initially going to call this a baby pink, but it's not. It's got a lot less white in it than something like Essie- Ballet Slippers or Misa- Blush Hour, for instance. This is a very basic pink, I think, but I really liked it once I had it on. Formula: The consistency is very jelly-like. Houston, we have a CRELLY! Ugh, what a word! Anyway, the texture is thick, but still kinda syrupy, if you know what I mean. Cole is a pastel orange-peach creme that manages to be bright and pastel at the same time. It's much more orange and less pink than either Essie- Haute As Hello or Essie- Van D' Go. In the bottle, it's similar to the new OPI- Where Did Suzi's Man-go?, but the OPI is noticeably a couple of shades darker. It is, though, fairly similar to Illamasqua- Purity, but Purity is about a shade lighter. They have the same peachy tone, though. This is a very flattering and happy color, and in fact, I'm still wearing it AS I TYPE THIS. Three coats gives decent coverage, but some nails still had faint streaks...which in person (not photographed) are mostly imperceptible. So, like Dot, I needed four coats for opaque coverage, although maybe if you have very short nails you won't? I do have to give Cole credit for not bubbling on me. I used a thicker fourth coat to make sure the surface would level and not drag, and didn't have any bubbling problems- so, point there. Monet is an iridescent hexagonal glitter in a clear base. In the bottle, the base appears pink, but goes on the nail pretty transparently. I did a skittle for you with five of the colors from Awaken, so you can get an idea of how it layers over each. I feel as though my hand ended up resembling an Easter basket. True story. Formula: The base is definitely thicker than I'd like, but it's still workable. If you're going for dense glitter coverage and have to use two coats, I can see the thickness becoming a problem; but, for just a sparser, one-coat glitter look, the base actually helps you float the glitter over the nail and distribute it pretty well, I think (as long as you thoroughly wipe off one side of the brush). Make sure your base polish is pretty dry before applying this, or the glitters will sink into it slightly, giving a recessed look. 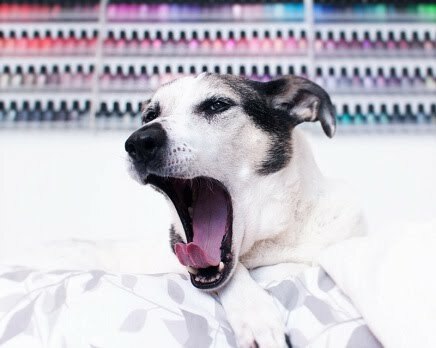 So, that concludes Zoya's Spring 2014 release! What do you think? Disclosure: these polishes were provided to me as press samples for honest review, and all opinions are my own. Awesome review. Your notes on formula are always So spot on. These polishes are hella cute, and yes to the glitter sink!! I feel like so many glitters get a bad rep from being applied over wet base. This is the first manicure where I've really liked Monet over the glass flecks :D Hide you easter basket hands from small children, lest ye be eaten. It's pretty, but I'm not sure it's worth the hassle. I'm a two coats girl. Which is sad since I was kind of yearning for Cole. Hmm....I really like Dot. I expected to like Monet much more. Kind of glad I didn't rush out to buy it. Thaaaank you! I often struggle with formulas other bloggers say are great, so I tryyyyy to describe my experiences in a lot of, probably overkill, detail. OMG @ little children eating my hands- NOOOOooooo, I need them, for doing things. And stuff. I like it- but I don't think it's earthshattering! Me too- I feel your pain! Every time a peach polish comes out, I am hoping for a two-coater. Alas. Beautiful! Can't wait to try Dot & Monet! Mail-time: Zoya Awaken & Monet Polishes!